I created a new Chrome Extension: Internalize for Google Analytics. This is its very first version. It only works on websites with Universal Analytics. 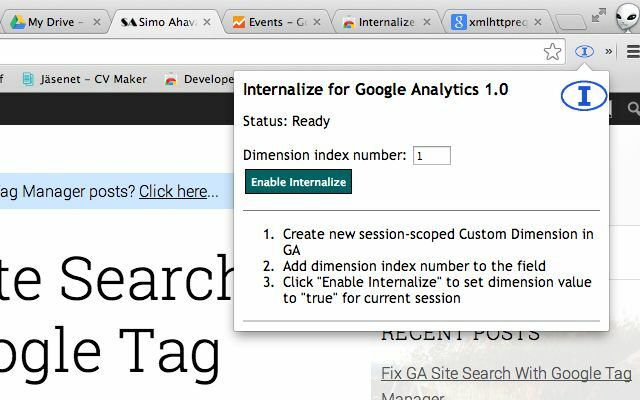 Click here to download Internalize for Google Analytics v1.0 The idea is that with the extension you can push a custom dimension value to your currently active session. You can then use a profile filter in GA to block traffic with this custom dimension value. It’s useful when blocking internal traffic with more traditional means (IP address or various GTM workarounds) won’t work. In this post, I’ll walk you through a tutorial on how to create a Google Tag Manager extension. This extension will be a new listener, whose sole job is to listen for changes in the HTML and CSS markup on the page. The reason I’m teaching you how to create a DOM listener is simple. Ever so often I come across people asking for help, but they are unable to touch on-page code.